Where can I store my luggage in Sydney? Looking for a place to store your luggage in Sydney? Whether you want to drop your bags off and head into town before your next flight or waiting to check in to your Airbnb, Stasher has got you covered! Thanks to a network of hundreds of local shops and hotels, Stasher allows you to safely and easily store your bags so that you can make the most of the city. Whatever the case, you probably want to store your bags and avoid having to haul them everywhere, from buses and crowded sidewalks to museums and white-sand beaches. There are different solutions available if you need to drop your bags off safely. We’ve done the hard work for you and put together a list of luggage storage facilities, from airports and train stations’ facilities to drop-off locations in the city centre. Need help with your booking? Our award-winning customer service is always on hand to help you out! Reach out to us 24/7 for any questions you might have regarding our service. ✔️ Each item you store with Stasher is insured for up to 1000€. It’s just A$8 per day and A$7 for an additional day! Stasher’s goal is to make travel easy and stress-free 💁. This is why we aim to have luggage storage locations within walking distance of all main tourist attractions, so you can find some time to discover everything Sydney has to offer. 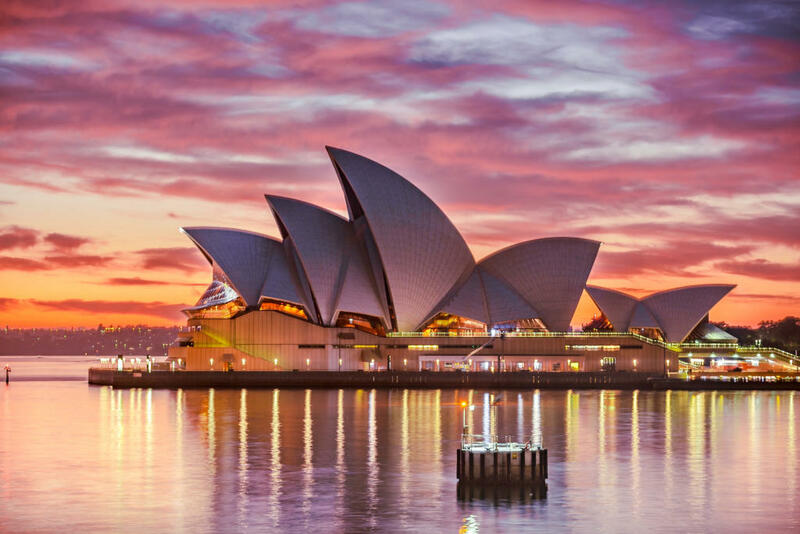 Attractions such as the Sydney Opera House 🎶, the Rocks, and the Darling Harbour, as well as transport hubs such as Sydney Central Station 🚉 are only a stone's throw away from our luggage storage locations. Wherever you are, wherever you need to store your bags, we have a StashPoint nearby so that we can take that heavyweight and help you make the most of Sydney (or discover its most instagrammable spots)! A full list and a map of all of our Sydney locations. Now that you’re not dragging your luggage behind, why not take a walk around Carriageworks Farmers Markets or immerse yourself in cutting-edge art at the Museum of Modern Art? Sydney is at your fingertips! Use the search bar to find a suitable StashPoint in Sydney. The whole process takes approximately two minutes. All you have to do after booking is show up on location and drop off your luggage. Enjoy your day in Sydney without having to drag your luggage while admiring the historic neighbourhoods or climbing the Sydney Harbour Bridge! The Sydney Airport is only a short train ride away from the centre of the city. Stasher offers many luggage storage options around the main transportation hubs of Sydney. However, if you are in Sydney for a really short time, then you might want to consider luggage storage at Sydney airport. Prices are pretty steep, with rates starting from A$ 10 for a small bag. SmarteCarte offers luggage storage services at both international and domestic airports. The SmarteCarte office operates daily from 06:00 to 21:30. Prices scale according to the size of the item you want to store. Rates start from A$9 for a small bag for just a few hours. If you plan on leaving a carry-on for more than 24 hours, the costs add up to about A$28. Kingsford Smith International Airport is Australia’s busiest commercial airport hub, with three terminals. T1 is used for international flights. The Airport Link is the fastest option to reach the city centre. Sydney’s International Airport is one of the oldest in the world, operating continuously since the 1920s. SmarteCarte, the same company operating Sydney’s airport luggage storage, has a facility at Central Station. However, luggage storage services are only offered to valid ticket holders. Stasher has a lot of luggage storage options around the Sydney Central Station. Check them out here. Another option available for passengers travelling on NSW trains is to deposit their bags at the NSW luggage collection and drop-off counter on Platform 1. Bear in mind: this service is only available for NSW TrainLink customers with a ticket for travel on the day they wish to store their luggage.No luggage will be accepted for storage overnight. SmarteCarte offices operate from 06:00 - 22:00 every day. Storing a small carry-on will set you back about A$24 for the day, while the costs add up for larger bags and additional items. Sydney Central is the busiest and largest railway station in the state of New South Wales. It serves as a major transport hub for NSW intercity trains and commuter rail services. It is also the main state bus and private coach hub. Stasher offers affordable, convenient and secure luggage storage in Sydney. However, we understand if you want to check all the additional options at your disposal. That’s why we have listed them below for you. Bear in mind that luggage storage in Sydney can be quite expensive and you won’t get the same level of customer support you are enjoying with Stasher (for a fraction of the price). There are luggage lockers at the World Square shopping centre operated by the company CBD. At $24 a day, they are a fairly expensive option, especially considering the alternatives available. If you are searching for luggage storage near Circular Quay, you can check the Sydney Visitor Centre. Their service is available to cruise passengers only.